Tsukemen means "dipping noodles"—cold noodles are served separately with hot dipping soup and toppings on the side. 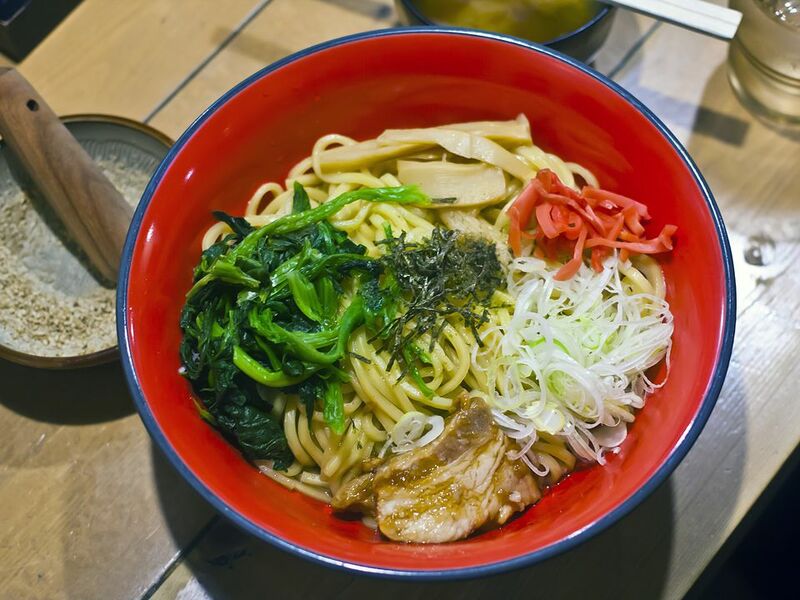 (Hiyashi Tsukemen is served with cold noodles and cold soup). This recipe uses chukamen (fresh ramen noodles) that are springy and chewy, and the cold noodles go well with hot soup with all kinds of toppings in it. You pick up few strands of noodles with your chopsticks, dip them into the soup, then slurp them up. Tsukemen has its own rich history. If ramen is the perfect choice during cold seasons, tsukemen is the savior for noodle-craving Japanese on hot, summer days. Tsukemen is served with cold noodles separated from the sauce or soup. The way to eat tsukemen is simple: take an ample amount of noodle then dipped it in the sauce that is usually placed in a stone bowl to preserve the right balance of heat and maintain the firmness of the noodle. That is quite the opposite of a ramen dish, where everything is served in one large bowl and is served hot. This recipe calls for mirin, It is a type of rice wine similar to sake, but with a lower alcohol content and higher sugar content. Eating Tsukemen is simple really; grab a small bunch of noodles with your chopsticks, dip it in the soup and then down the hatch. If you dip too many noodles at one time, though, the taste of the soup becomes a little too overpowering. The soup itself has a very dense flavor. The recommended way is to grab 2 or 3 strands of noodles at a time and dipping them in the soup. Remember that contrary to other cultures, the louder you eat the noodles and sip its sauce in Japan, the better because it shows that you are enjoying the delicious meal. So the louder the slurping, the better. Heat chicken soup stock, soy sauce, and mirin in a saucepan. Bring to a boil and stop the heat. Add vinegar and stir lightly. Set aside. Boil lots of water in a large pan. Add Chukamen noodles in the boiling water and cook for a few minutes, following the instructions on the package. Drain ramen noodles in a colander and cool them in ice water. Drain well and serve on plates with your favorite optional toppings. Serve dipping soup into individual bowls.